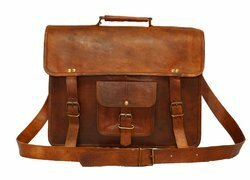 Exporter of a wide range of products which include 15 inch leather vintage crossbody messenger satchel bag, vintage leather messenger bag, genuine leather vintage leather messenger- shoulder bag 15 and 24" pure leather travel sports gym duffle bag for men. 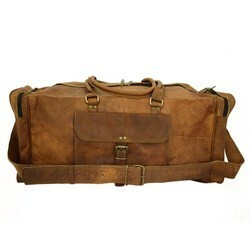 We are the leading manufacturers and suppliers of the 15 Inch Leather Vintage Cross body Messenger Satchel Bag. External QUICK ACCESS POCKET, your 15-inch shoulder bag is perfectly sized for tablets, laptops, notebooks & more. Ideal for office, college & school. Strong & Durable: Brass Fittings & Buckles, YKK Zippers, Olive Green Heavy Duty Canvas Lining.... Built to Last: This leather satchel features quality stitching, brass buckles & strong zippers. Ultra-durable, reliable & secure. Even has heavy-duty Velcro strap to protect contents. Packaging Details: All kinds of packaging ranging from the Standard Package to Custom Packages with bubble wrapping, bar coding available. PU foam packing, thermocol sheet reinforcement available as per buyer specification. Size Available 5 x 7" , 7 x 9" & 9 x 11"
This messenger bag is a perfect blend of elegance and a contemporary feel. This bag has an adjustable strap that allows it to be carried with ease. Adjustable shoulder strap, full flap bag with magnet lock,two big inner compartment for carrying files, tab's etc and two chain compartments for important documents/paperwork etc. Packaging Details: Polythene bag + Inner 5 ply + Outer 9 ply Master Carton. Packing as per buyer's specification will be chargeable accordingly. 100% genuine leather Duffel Gym / Sports / travel /cabin Bag with durable inner canvas lining and antique look accessories.Multi utility bag can be used as a travel, picnic, gym and sports bag etc. Big enough to carry weekend clothing and accessories. Genuine handmade product made from chemical and dye free leather. Veg tanning using natural edible oil and Sun tanning used for obtaining shades. Bag gives a wonderfully unique and antique look with use. A nice travel bag option and a perfect companion and gift for your close ones.